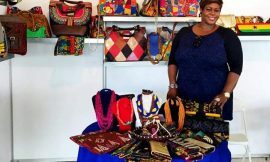 Following the success of 2012 event with close to 1,000 people in attendance at Coconut Groove Hotel in Accra, Ghana, where 19 designers across African countries were given a platform to sell and showcased their designs. The organizers of Fashion Night Out, Ghana has been working hard to make the 2013 more glamorous as it is not going to be ordinary fashion event but celebration of Ghana fashion industry. Fashion Night Out, Ghana 2013 aims to celebrate hard work and creativity of designers in Ghana fashion industry. The celebration will bring together media from both local and international arena, buyers and consumers to see the current collections of designers in the fashion capital of Accra, Ghana and to host 150 exhibitors at Ghana international trade fair, exhibiting all kind of products ranging from clothing, shoes, bags, jewelries, accessories and beads, hair product, body products, baby kits, arts craft, etc. The platform aims to cut across geographic and culture barriers and position itself as a business of fashion and design event targeted at showcasing the best of the fashion and design industry, drive the Ghanaian fashion economy and ultimately uplift its profile within the industry. This year event is scheduled to hold in May 2013 with the theme “Globalizing African Fashion”. Registration for designers to exhibit or showcase is open on our website.